National monuments; Political aspects; United States. National monuments; Social aspects; United States. 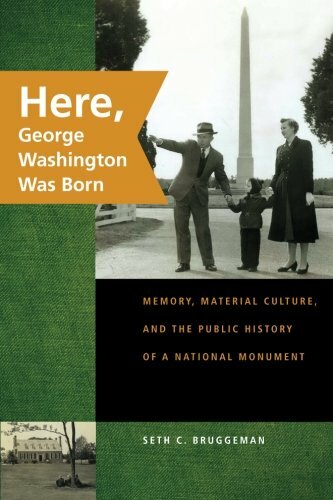 In Here, George Washington Was Born, Seth C. Bruggeman examines the history of commemoration in the United States by focusing on the George Washington Birthplace National Monument in Virginia's Northern Neck, where contests of public memory have unfolded with particular vigor for nearly eighty years. Washington left the birthplace with his family at a young age and rarely returned. The house burned in 1779 and would likely have passed from memory but for George Washington Parke Custis, who erected a stone marker on the site in 1815, creating the first birthplace monument in America. Both Virginia and the U.S. War Department later commemorated the site, but neither matched the work of a Virginia ladies association that in 1923 resolved to build a replica of the home. The National Park Service permitted construction of the "replica house" until a shocking archeological discovery sparked protracted battles between the two organizations over the building's appearance, purpose, and claims to historical authenticity. Bruggeman sifts through years of correspondence, superintendent logs, and other park records to reconstruct delicate negotiations of power among a host of often unexpected claimants on Washington's memory. By paying close attention to costumes, furnishings, and other material culture, he reveals the centrality of race and gender in the construction of Washington's public memory and reminds us that national parks have not always welcomed all Americans. What's more, Bruggeman offers the story of Washington's birthplace as a cautionary tale about the perils and possibilities of public history by asking why we care about famous birthplaces at all. About: In Here, George Washington Was Born, Seth C.